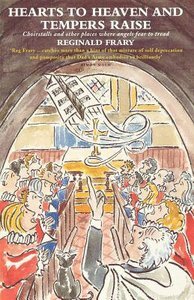 This title perfectly captures that world of draughty church halls, musty-smelling hymn books, tyrannical organists and amateur singers more willing than able. About "Hearts to Heaven and Tempers Raise"
Reg Frary sang in his local church choir in Richmond for over seventy years and wrote comic stories based on his experiences for almost as long. He worked as a proof reader for a major law firm in the City of London and was at one point the City's oldest employee. He died in 2011.